Losing a father as a boy is not unusual. Losing a father before you are born is VERY unusual. Posthumous children, those whose fathers die before the child is born is rare – even in an age when life expectancy was low. That three Presidents out of the forty-four men who have held the office, were posthumous children is not just rare, it is exceedingly rare. That these fatherless boys, Andrew Jackson, Rutherford Hayes and William Clinton managed to rise to the top is nothing short of amazing. 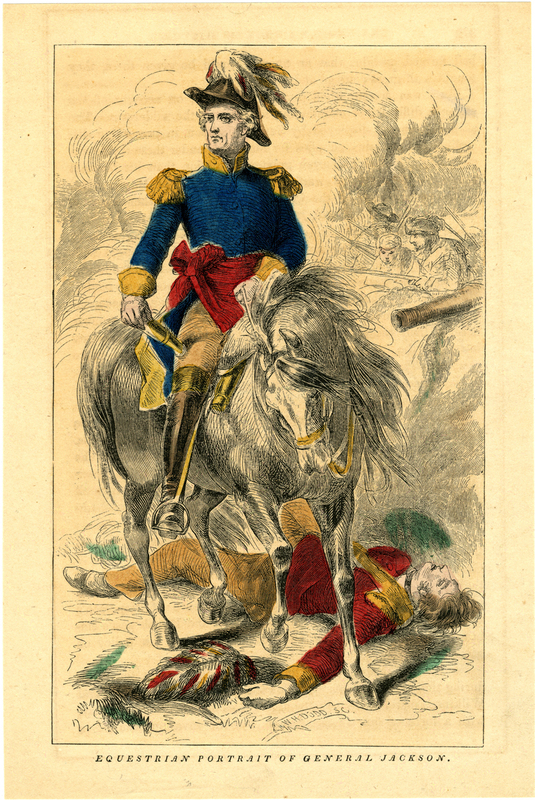 Just weeks before Andrew Jackson (1767-1845) was born, his father was killed in an accident. His mother raised him and his two older brothers in a rural area on the southwestern border between North and South Carolina. Both states still argue over the birthplace rights. Andrew Jackson was, boy-to-man, filled with daring and bravery, to a point of rash. Andrew grew up to be a wild boy, with little interest in schooling or discipline. At twelve or thirteen, he “enlisted” as a messenger during the Revolutionary War, since he was an excellent horseman, knew the woods and trails, and had a reckless and daring disposition. He was captured. When the British officer demanded that the boy clean his boots, the cheeky Andy refused, and the officer slashed him with his sword, scarring his face, his hand and most importantly, his soul. Then he was imprisoned. By fourteen, Andrew was not only completely orphaned, but completely alone, His mother and two brothers had died. By eighteen, he had squandered whatever little money he had, and decided to “read law” – if any attorney would have him. Andrew’s reputation as barely literate and ungovernable was well known, and most attorneys disdained. That one agreed to take him on was fortuitous. That Jackson actually applied himself and learned law sufficiently to be admitted to the bar, was a near miracle. Andrew Jackson never had the benefit of solid male influence. On the flip side, however, even though he never had children of his own, he would be a generous (albeit mostly absentee) father image to his two “adopted” sons and guardian to several wards. He was a fond and devoted uncle to his wife’s numerous nieces and nephews. With not a soul of blood family, Andrew Jackson was happy to give whatever male-bonding he could to the cadre of young people who flocked to his banner, providing advice, guidance, financial and even fatherly support, particularly once they were grown. Rutherford Birchard Hayes (1822-93) lost his father shortly after his conception. His mother Sophia raised him and his older-by-two-years sister Fanny, alone. But not quite alone. The young widow’s 18-year-old brother Sardis Birchard was available to help, and was the most fortuitous relationship in Hayes’ life. 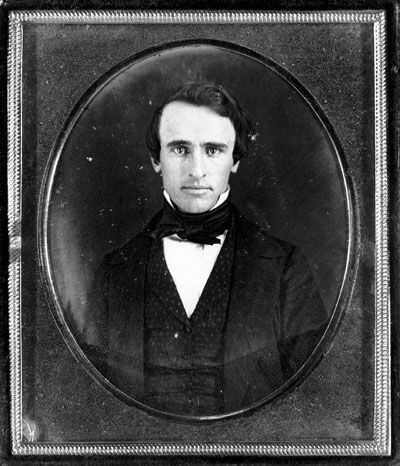 Young Rutherford B. Hayes – long before the full beard. Uncle Sardis became the man of the family, not only assisting financially, but providing the father-figure influence. He never married, but became a wealthy Ohio businessman and prominent citizen. Perhaps most importantly, he was completely devoted to his niece and nephew. It was Uncle Sardis who insisted – and paid – for young Rud to attend Kenyon College, followed by Harvard Law School. (Hayes was the first President to go to a formal academic law school.). Then, he assured Hayes of a successful practice when he entrusted his many business affairs to the young attorney. It not only gave him experience, but it introduced him to other prominent citizens and potential clients. And it was also Uncle Sardis Birchard who built the house at Spiegel Grove, and insisted that his nephew and his grown family move in with him. Then he gave them the house. Rutherford Hayes was indeed lucky to have such a strong and devoted male figure in his life, to provide not only a father-image, but a grandfather-image to Hayes’ children. In turn, Hayes became a devoted and supportive father himself. 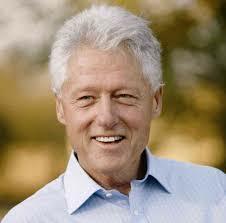 William Jefferson Clinton, born William Jefferson Blythe, could have benefited from a strong male role model. His natural father died in a car accident a few months before Bill’s birth. His mother Virginia moved back to Hope, Arkansas to live with her parents. Unlike his posthumous POTUS predecessors, his mother remarried a few years later. It was not a happy marriage, but it lasted until Roger Clinton’s death in 1967. Virginia would marry twice more. While Roger Clinton, Sr. never formally adopted the boy, Bill began using the last name of Clinton when he was around fifteen. That Bill Clinton was a smart boy-to-man and managed to attract mentors and get scholarships to prestigious schools, reflects more on himself than on any fatherly (or step-fatherly) influence. Virginia was not the best of influences either. Somewhat flamboyant, she likely provided the seeds for Clinton’s obvious penchant for the “sporting” woman. Bill Clinton’s personal charm, of course, may have been inherited. Or not. What is interesting about the fatherless Bill Clinton took place many years later – after he was President. POTUSES are a small fraternity, and even the most ardent adversaries, politically, philosophically or otherwise find themselves with unique bonds. Some form strong friendships. 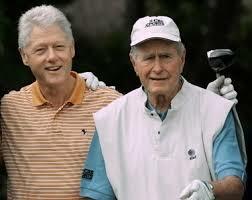 President Bill Clinton (#42) and President George H.W. Bush (#41) have become good friends. After the tragedy of September 11, 2001, when George W. Bush was President, he found it advantageous to appoint his father, former President GHW Bush, and his immediate predecessor, Bill Clinton, to co-chair a charitable organization established for the victim’s families. The pairing of the former adversaries of 1992, from different parties and different backgrounds, was perhaps one of the most important relationships in Clinton’s mature life. The elder Bush, born into a solid upper-middle class family with a strong, albeit remote, paternal influence, became a strong and accessible father himself to his five children, who by 2001, were all grown, married and parents themselves. The Bush family is a unit. This entry was posted in A POTUS-FLOTUS Blog, Andrew Jackson, Rutherford Hayes and tagged American history, Andrew Jackson, Bill Clinton, Feather Schwartz Foster, George H.W. Bush, George W. Bush, GHW Bush, Hayes Uncle Sardis Birchard, history, Posthumous Presidents, President Andrew Jackson, President Bill Clinton, President Clinton, President George H.W. Bush, President George W. Bush, President Hayes, President Jackson, President Rutherford B. Hayes, Presidential history, Rutherford B. Hayes, Rutherford Hayes, Sardis Birchard, US history, William Clinton, William J. Clinton. Bookmark the permalink. Interesting look at three POTUS.